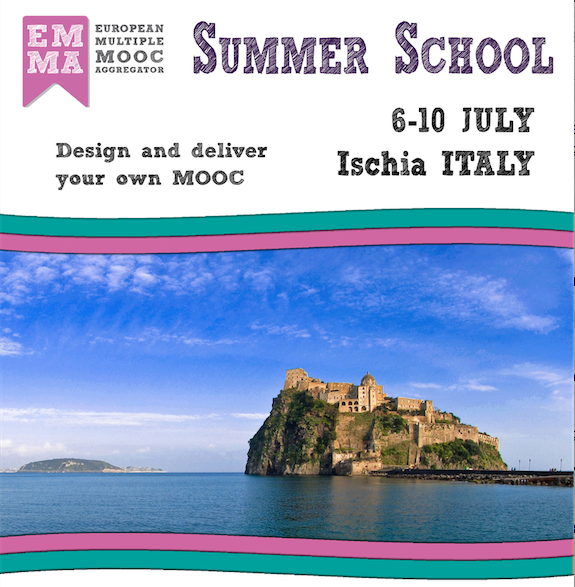 I was invited to lead a workshop at the ‘Design and deliver your own MOOC’ summer school run on Ischia, Italy, by the European Multiple MOOC Aggregator (EMMA) project from 6-10 July 2015. The summer school was organised jointly with JTEL, and the workshop was attended by people from both projects. Workshop description: This hands-on workshop will work with learning design tools and with massive open online courses (MOOCs) on the FutureLearn platform to explore how learning design can be used to influence the choice and design of learning analytics. This workshop will be of interest to people who are involved in the design or presentation of online courses, and to those who want to find out more about learning design, learning analytics or MOOCs. Participants will find it helpful to have registered for FutureLearn [www.futurelearn.com] and explored the platform for a short time in advance of the workshop. Intriguingly, my presentation (slides above) was immediately very popular on Slideshare, taking only eight days to become my most-viewed presentation ever – far outstripping a presentation with exactly the same title that I posted a few months ago, as well as my other presentations that have steadily been building up views over the past seven years. This entry was posted on July 21, 2015, 4:24 pm and is filed under Analytics, Esteem, Events, MOOCs, Open online learning, Presentations. You can follow any responses to this entry through RSS 2.0. You can leave a response, or trackback from your own site.